Abstract: The unit features a max transfer speed of about 16.6MB/s and installs in any Windows 98/ME/2000/XP in just a second without the need for drivers. When I say the name Taisol what's the first thing that comes to your mind? If you said heatsinks you're not alone, Taisol are a large OEM and consumer heatsink manufacturer, and if you've ever owned a Slot A Athlon, chances are you also used a Taisol heatsink to cool it. During a meeting with Taisol at Comdex to discuss, you guessed it, heatsinks, we learned that the company also has a presence in the socket and connector markets. 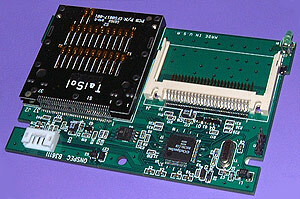 One of the devices which Taisol have recently introduced is a patented 4-in-1 flash media connector. This tiny little black connector is undoubtedly soon to find its way into media bays, USB-based media readers, notebooks and countless other devices. Since it measures about 5mm thick and 45mm wide, it is easy to embed the unit in the smallest of locations. With the growing number of motherboard manufacturers including rather large and bulky media bays with their deluxe editions, a switch to something of this size would free up a lot of space for other devices, like audio or fan-speed controls for example. 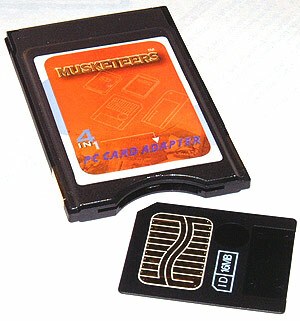 One adaptation of ths connector made its way to us in the form of a Type II PCMCIA card. The Taisol "Musketeers" (get it? 4-in-1... all for one, one for all!) flash memory adaptor supports Secure Digital (SD), Multi Media Card (MMC), Sony Memory Stick (MS), and Smart Media (SM) flash memory. The unit features a max transfer speed of about 16.6MB/s and installs in any Windows 98/ME/2000/XP in just a second without the need for drivers. Aside from not needing to "stop PC card" in the menu tray to change cards, the Taisol Musketeers 4-in-1 flash memory to PCMCIA adaptor is a really little handy device. Since I've been using a Fujitsu Lifebook P2000 notebook for sometime now, the lack of any floppy drive can be a bit frustrating at times. Although the P2000 notebook is equipped with a CD-RW burner and 802.11b wireless connection it is sometimes just easier to grab a floppy disk when a little bit of data needs to be quickly transferred. With a full set of flash media bays now open (except of course Compact Flash) I've switched over to Smart Media modules for quick data transfer!